German airline Lufthansa is encouraging passengers and soccer football fans to "get the football fever, experience Lufthansa, and discover Brazil" by swapping titles on eight aircraft - calling them "Fanhansa." Starting today, the airline will replace their well-known lettering for the duration of the tournament on three short-haul and five long-haul aircraft, including Airbus A321s and Boeing 747-8i (pictured above). 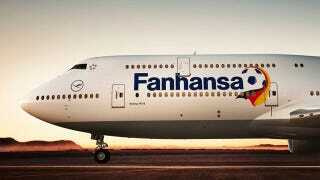 "Fanhansa is more than a logo on the aircraft, of course – it is a surprise for our customers and a thank you to our fans. Over the coming days, we will be creating new travel experiences with a number of different promotions – there is no doubt that we will be flying the happiest fans to Brazil with Fanhansa, offering the best World Cup atmosphere and pure football fever. It will make Lufthansa the official carrier of all football fans." Lufthansa says they'll not only be flying the German national team to Brazil, but thousands of fans, media and dignitaries. They'll also be offering surprises to customers on board flights of these special planes, along with opportunities to win trips to Brazil.